Running errands for ideas at the intersections of economics, org theory, higher ed, and open pedagogy. I don’t often blog about personal stuff. I usually write about ideas, economics, or education. This is an exception. It’s on the long side. I understand if you haven’t time to read it. I just need to share it. It’s about some experiences I had and lessons I’ve learned. But like most of my posts, I’ll wander around and tell all kinds of background before I get to the point, so get a beverage and sit down. The first week of March this year was spring break at both my school and the school where my wife teaches. It’s nice when our breaks coincide. This year we did something different for us. We took our first cruise. 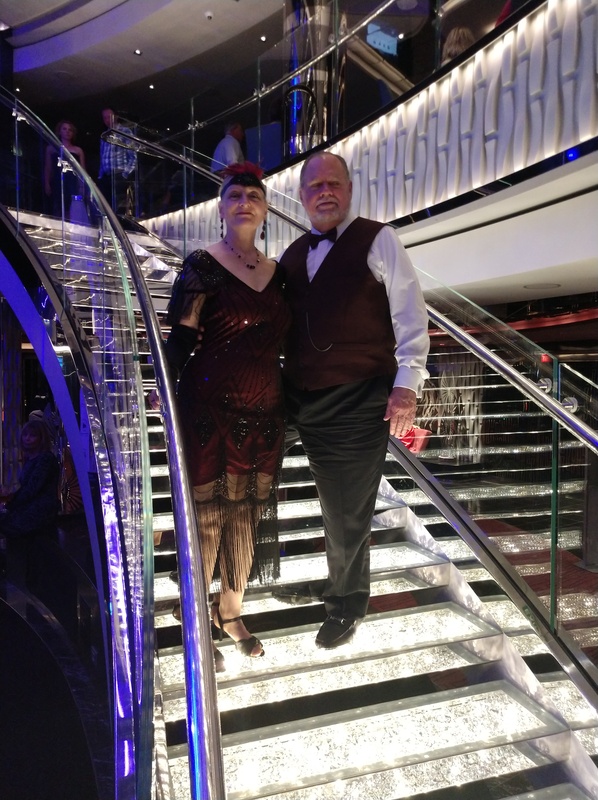 A colleague of mine, a long-time cruiser, convinced us to join her and her husband on a cruise. It would be fun, they said. It’ll be relaxing, they said. They were largely right, but it turned into quite an adventure for me with some lessons along the way. We left from Miami for a week in the eastern Caribbean with stops in San Juan, St. Thomas, St. Maarten, and Nassua. But the lessons have little do with what we saw. 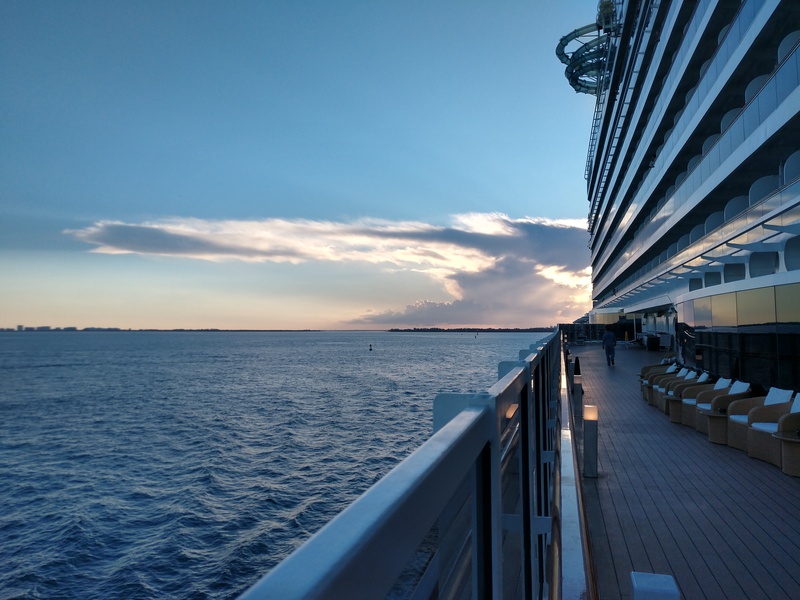 I indeed observed a lot – like I’ve said before “For a social and institutional economist with a critical bent that just loves to observe people and capitalism in the wild, let’s just say that a cruise offers a target rich environment.” I still plan to write about that later. 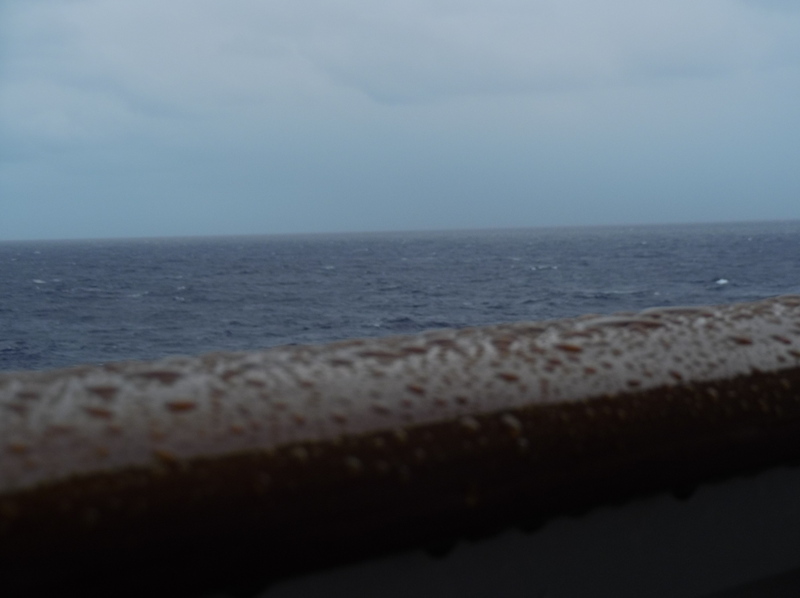 This post is about more intimate, personal experiences on the cruise. The most unexpected lessons weren’t about what I saw. They were about how I saw. More than that, they were about how I experienced the world and how people interacted with me. You see, I’m a part-time blind guy. I have keratoconus. It’s a relatively rare (1 in 2000 in the US) disease. It’s a progressive deterioration and deforming of the corneas. I developed it in middle age a couple decades ago. I’m kind of a medium case right now and I’ve been blessed that the deterioration has stabilized in recent years. That’s good news because end-stage is cornea transplants. What I see without lenses. Actually this is just slightly worse than my right. My left sees much worse though. In keratoconus, what should be a nice clear dome shape of the cornea that focuses all incoming light onto a small point on the retina becomes a thin, steep, really weird shaped cornea that focuses the light onto multiple points or just scatters it all over. Instead of an nice round dome, the topographical mapping of my left cornea looks a lot like a map of a mountain range with uneven peaks, steep sides, and not centered. My right eye without lenses sees octovision. I see eight or more of everything slightly overlaid. Edges get very fuzzy and uncertain. My left is worse. The left eye without lens essentially wipes out all edges. Everything is glowing, scattered, haloed, and smeared. I say I’m a part-time blind guy because there is a way I can see for part of the day. I use some very specialized rigid gas permeable contact lenses. Yes, they have some refractive correction in them, but their real function is to be artificial corneas. They float and balance on the peak of the cornea, trap tears inside, and become, in effect, an artificial dome-shaped cornea. The light focuses just fine when I wear them. With lenses in, I’m 20/20 in both eyes. On a good day in the morning and without wind, I might even test out at better than 20/20. These lenses make my everyday life possible. 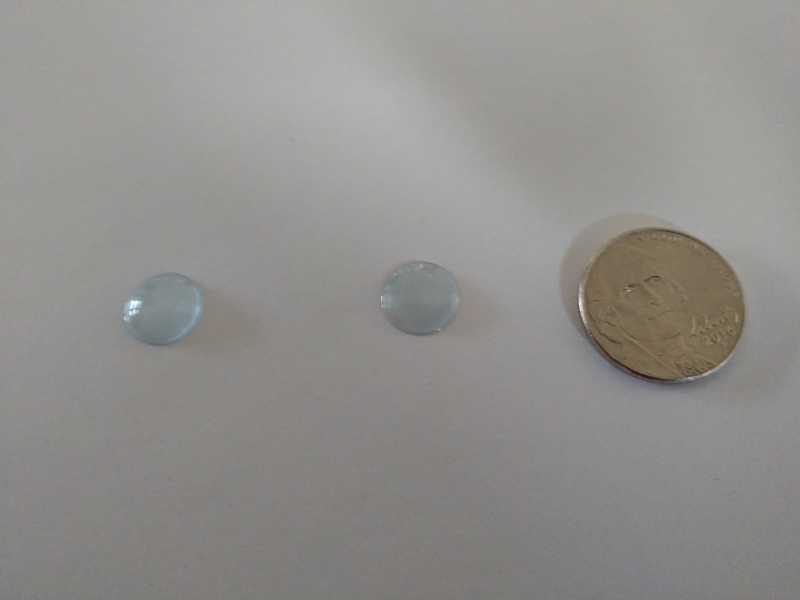 My lenses – nickel for size comparison. Thanks: People work everyday miracles. (I’ve known this for a long time). Those lenses are miracles to me. They do so much. But it’s not a thing, it’s people that enable me to see, to drive (which I love! ), to work, and to see people’s faces. I know that these lenses don’t just happen. There is a long, long list of people who make my day possible. The researchers, my doctors, the people at Kellogg Eye Center at UofMich (and Kresge Eye Center, Wayne State back when I went there). There’s the people who work at the companies that make these things. There’s the engineers that have designed the machinery that can manufacture these tiny little flecks of rigid plastic that float on the tip of my eye. They are all so smart. They’ve studied and learned and as a result, I can see. Except for my doc and his assistant, I don’t know any of them personally. I wish I could thank them all. Living with keratoconus and RGP lenses is work. Keratoconus also comes with dry eye, but the lenses depend on normal tears to float and work. It’s tricky. Wind can dry out the lenses in a flash. And by wind, it doesn’t have to be storm-warning stuff. A strong puff from an air conditioner vent in the jetway ramp right to at your face when you’re boarding an airplane will do it. Experience has taught me to close my eyes quickly and put my hands up to feel around right away. I have to carry a kit bag with different protective glasses, 4 bottles of fluids, cases, and backup lenses at all times. Lenses can easily lose their float – after all they’re like balancing a saucer on an off-center peak. When they lose the float, the edge of the lens digs into the cornea. It’s sharp. It’s painful. Trust me. It will get your attention and that lens will have to come out RIGHT THEN AND THERE. That of course, will freak out your class when it happens in the middle of a lecture (experience talking). But taking them out is tricky too. They pop out and bounce on any hard surface. So ideally, you want to take them out with your nose over some white towel or sheet in a windless environment. If there’s wind or they bounce when you pop’em out, well, good luck finding it. It could be anywhere . Yes, this is more experience talking. You’ll need help finding it. This part-time blind guy isn’t very useful at finding tiny little things when he’s blind. My wife can tell you stories, so many stories, of the “fun” of searching for a nearly transparent sliver of light blue plastic. We’ve found them as much as 10 feet away and behind another piece of furniture. And that’s all if they pop out. The worst is when they don’t. They can get stuck. They can get suctioned onto the eye. They can get off center and be in the corner or even below/on top of your eye. When that happens, there’s a little tiny inch-long rubber plunger that can be used to grab it and take out. Of course, I can rarely do it. I can’t see in my own eye. But I’m lucky. I have a wonderful wife that steps right up and fishes around in my eye with that little plunger. When we need it, I love that having that little rubber stick poked in my eye because it means the pain will stop soon. Even on a good day, my eyes will likely only tolerate the lenses for 9-16 hours a day. It’s unpredictable. So that’s why I say I’m a part-time blind guy. I can see fine, albeit possibly with some pain, for 9-16 hours a day. But for the rest of the time, this boy can’t see those steps and has no depth perception. The lenses are tricky to insert and get right. If I have to move one when it’s in my eye but not on-center, there’s a high risk of scraping the cornea. A corneal abrasion means no lenses for a few days while it heals. It also means pain. I’ve long hesitated about saying much on the web about my vision impairments. I’m not looking for sympathy and in the grand scheme of blindness/visual impairment, my keratoconus is just a nuisance. It’s manageable and thanks to all those wonderful people who studied at school, I can see just fine for part of the day. Just before the spring break my school ran an Accessibility Summit conference for STEM. There were a couple blind speakers there. White cane and braille blind. Full-time blind. I don’t want to take anything away from the attention and help they or anybody else needs. But when I was talking to those speakers at the summit, they actually mentioned something about keratoconus I had largely ignored. It’s painful. Very painful. Scattered light in the eye hurts. Bright lights – especially LED lighting – is painful. I hate them. That’s why at a conference you’ll sometimes see me wearing the dark sunglasses indoors. And along those lines, shiny surfaces and glare are not pleasant things. I hate them too. 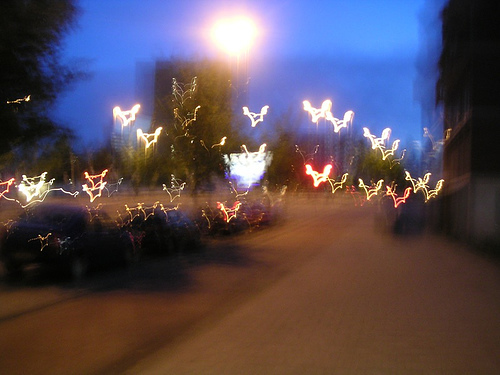 Keratoconus is one of those rare visual impairments where the problem is too much light, not darkness. So what the heck does all this have to do with the cruise? A lot. The beginning of the trip was inauspicious. Wind in the jetway boarding the plane to Miami had my wife leading me by the hand with tightly closed eyes. It was an omen. Bright spring, tropical sunlight and more wind at the port boarding the ship had me really struggling. Then we got on board the ship. It was a relatively new, less than year old, ship. 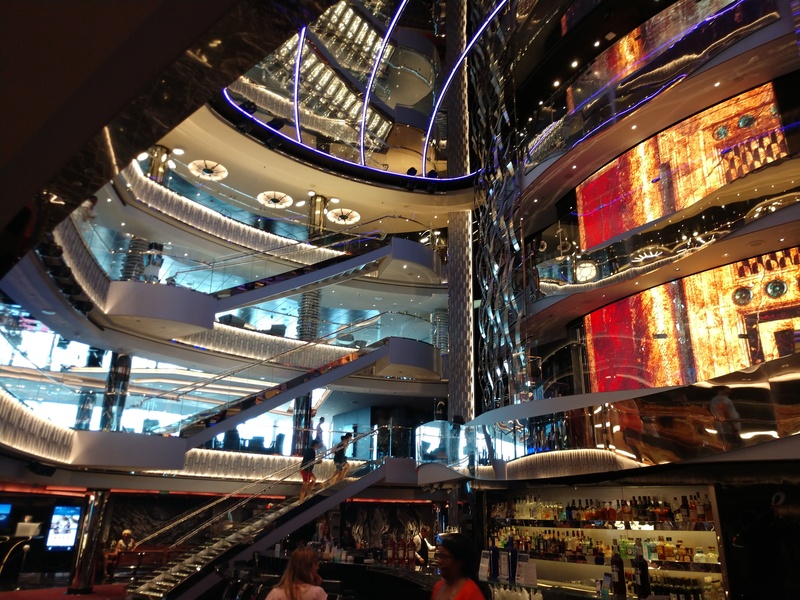 And like most newer cruise ships, it has big open, multi-story spaces inside. The designer on this ship overdosed on shiny surfaces and bright LED lights. Oh my god. I don’t think you could design a worse environment for keratoconus. Glare. Bright lights bouncing off everything and everywhere. And the eyes and lens were drying out. I couldn’t keep my tears flowing right, even with frequent use of the eye drops. I learned a lesson that first night. I’m sure I’ve experienced it before, but this time I was conscious of what was happening. The lights, the glare, the winds (even indoor), are a lot of work. There’s a lot of cognitive monitoring of my eyes and my lenses – how do they feel? Are they floating? Should I add drops? Should I look away? Which of the 3 pairs of glasses/shades should I wear to protect them? Cognitive load. Work. It wasn’t leaving much energy or brain left for anything else. So I became really sensitive to the loud speakers and audio systems. It seemed louder. It was overload. I didn’t want to hear anything or listen to anyone. My brain was working too hard just on seeing and sorting out all the glare and multiple visions. I craved quiet. But of course, it’s first night on a ship for 5000 people who are craving fun, party, and escape. And there’s a capitalist cruise line craving those cruisers’ cash for drinks and gambling. I was so exhausted by the time I got to the cabin that night I just wanted to cry. I thought my adrenaline and cortisol levels would never drop that night. Lesson: People who deal with disabilities are working really hard all the time. You can’t see it from the outside. They may not recognize it themselves. It’s just the normal world to them. As teachers, we need to remember this. Dealing with a disability, even when it’s going well, can still be a heck of a cognitive load and make it harder to learn other things with other stimulation.. Be patient. Be supportive. They’re not weaker than you. They’re stronger and dealing with more. The state room brought it’s own lesson. Visually it was better than common areas on the ship. But it still had all LED lighting. The balcony was lovely. Beautiful. No bright lights. A beautiful ocean. But it also had wind. I forgot, we were moving at 20 mph. There’s wind. Duh. In the state room I could take the lenses out. Ahhh! Relief. Rest for the corneas. But then a new lesson. I’m so accustomed to just doing things at home without lenses in. I spend a couple hours in the evening and early morning at home without them. Of course, when I get up in the middle of the night for biological needs, I don’t have them in. I never really realized till this trip how much I rely on memory and muscle motor memory to navigate my own house. I just know where everything is. I know where to step without seeing it or thinking about it – at home. This was a really cramped and different and strange environment. Just going to the bathroom in the middle of the night was quite an adventure – a reminder how limited I can be. By the end of the week, I was just fine. I had learned some kind of muscle-level or unconscious familiarity with the room. Lesson: Disability isn’t in the person. Accessibility and ability is about a specific person with a specific environment and task. I’m not like all blind people. In some environments, like my home at night, I can function as well (better?) as any sighted person, but a new environment takes time and produces anxiety. The next couple of days I got better at handling and avoiding the glare and shiny surfaces. I learned to just wear sunglasses or glare-blockers inside. I started to get comfortable with the room. We even had a lot of fun at a 20’s themed “Gatsby” party one evening despite taking photos on the worst who-in-God’s-name-thought-of-putting-bright-lights-on-open-steps nightmare of a staircase. I know I probably have some karma to work off for the thoughts I had that evening for the designer of that staircase. However, while I was calming down the lenses weren’t. They were getting harder to put in and drying out quicker. They wouldn’t float right. I was struggling to avoid wind because I so enjoyed being outside on a deck and watching the water while trying to read. (imagine a guy with contact lenses, sunglasses, and reading glasses over top of the sunglasses with a hat brim pulled down low to cut the sunlight). Finally, first thing Wednesday morning, I had to face reality. I put the lenses in and couldn’t handle it. They lost the float immediately. The glare was awful. I’ve had it this bad before. I realized I must have done a minor scrape to the cornea of my left. The right wasn’t behaving much better. There is only one thing to do in the event of an abrasion. No lenses. I was crushed. We were pulling into port in St.Maarten that day. I’d never been there. It was the one port I was really looking forward to seeing. I’ve had serious abrasions and even a cut on the cornea before. It’s a risk with these lenses. Those little pieces of plastic have sharp edges. They’re floating or supposed to. Abrasions make the keratoconus worse. Light really scatters and it’s even more painful. But there’s no choice. Corneas are amazing at healing themselves, but it takes going without lenses, without seeing clearly. I remember when I had to go a week without them 2 years ago. I was too scared to leave the house. Nothing felt safe. So the lenses came out. We headed down to breakfast in the buffet, my lovely and patient wife leading me. It’s chaos at breakfast of course. Hundreds of hungry people anxious to fill their plates at an open buffet. Fortunately for me, I’d already been to this buffet for four days, so I had some idea of the lay of the land. No bumps in the floor to worry about stumbling over except when going outside on the deck. I knew the general layout. I knew generally what foods were where. Also fortunately the food was fantastic and thus worth the work. Again, I learned things. With keratoconus, I can’t see facial details. I can’t even see faces. I can just tell there’s a big human-ish blob near my left side until it’s right in my face. That means I can’t pick up the subtle cues that people give off about movement. With my lenses I’d probably unconsciously see your eyes flit to your left and take that as cue to step to my left and avoid a possible collision. Without the lenses, I just tended to stand there waiting while everybody buzzed around this big guy imitating a tree. It took awhile to fill my plate. I also learned that when I can’t see people clearly, my sense of personal space gets bigger. I felt much more crowded than when I could see. I wonder if other visually impaired folk or people with other types of disability experience that too. Maybe they don’t know. I’m kind of weird in that I’m sometimes blind and sometimes not. I can make the comparison. One thing I remember from that breakfast was the sensitivity of one of the crew. I got briefly separated from my wife. I was carrying a plate and knew roughly where I needed to go. I was walking slowly, hesitantly, and with a hand out. One of the ship’s crew – the ones with an all-white uniform – was walking by, saw me, and stopped and politely asked if I wanted help. I didn’t really need help at that moment. But I remember how incredibly good it felt to know that somebody noticed me and cared enough to ask. I’ve tried to do that myself of course, but now I really know that I need to pay attention. Lesson: Pay attention. When you see people that might need or want assistance, ask them. Give them the agency. Even if they don’t need it, it feels good to be recognized and respected. 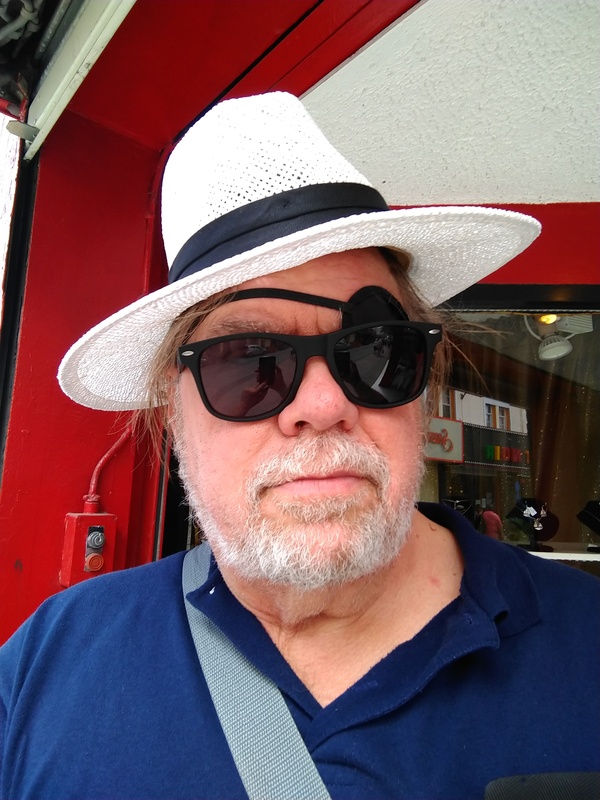 A different kind of pirate visits St. Maarten. We successfully navigated breakfast and made the decision to go for it. We got off the boat. We went into Phillipsburg, St. Maarten. Just getting off the boat was a small adventure. Lower decks. Gangplanks. Strange place to walk on the docks. But then we had to take a water taxi from the cruise ship docks to “downtown” Phillipsburg. Crowds. Stepping off a dock and down across a gap into a moving, floating water taxi. I have no idea which of those 8 sides of the boat I see is the real one and which ones are illusions leading to water. The crowds are impatient and I can sense my wife getting defensive about protecting me. We did it, though. It was beautiful. I could feel the air. Smell the water. Hear the music. I loved it. Thanks: To the guys who run the water taxi in Phillipsburg, St. Maarten. Thank you. Thank you more than you know. Getting on and off the boat was challenging and intimidating, Yes, I was scared. But you two guys just sensed I needed help, gently grabbed my arms, steadied me, and wouldn’t let me put a foot wrong. Somehow you managed to do that so smoothly while exuding a sense of genuine welcome and respect. I was touched. That’s how people should treat each other. We spent a couple hours in Phillipsburg walking around and getting a beverage. I loved it. It’s the most adventurous I’ve ever been without my lenses. Of course we didn’t get very far or see that much. My wife was, as always, fantastic. Led me by the hand on those uneven streets and sidewalks. ” 3 inch curb now, broken bricks, gap in bricks with dirt, inch down now, …” I want to go back and I want to see other eastern Caribbean islands now. I want to climb the mountains and hills. By Thursday evening, the eyes had healed up. I was able to put lenses in for a few hours in the evening for the “elegant formal night” affair (it’s really just adult dress-up party!). We found a quieter, less noisy, and darker lounge with a jazz quartet and had a lovely time. The rest of the trip was largely uneventful vision wise. The eyes and lenses cooperated. I got some rest. I saw a wonderful museum in Nassau. I sat on the beach. I read on the balcony. I watched the water. And I reflected on how fortunate I am. My eye doctors. Unknown engineers. My friends. Guys on water taxis. My wife. They all enable my accessibility and accommodation. Accessibility and accommodation is love. It’s recognizing and connecting with your fellow humans. I got to experience that love. I finally went on spring break as in “I actually got away from work and stuff”. We took our first cruise. For a social and institutional economist with a critical bent that just loves to observe people and capitalism in the wild, let’s just say that a cruise offers a target rich environment. I’ll have more on that in some other post yet to be written. But what I did want to comment on was the news last week in the edtech sector. Last week Advance acquired Turnitin, the notorious stealer of student intellectual property doing business under the guise of offering “plagiarism checking” services. Turnitin also has some other related businesses such an auto-grading service, etc. The price was apparently $1.75 billion dollars. That’s billion with a b.
I’m not here to talk about how awful the pedagogy of mistrusting all students is or how it’s immoral and unethical to steal/coerce student’s copyrights away from them. These are all horrid aspects of Turnitin and among the reasons why I’ve always, for over a decade, opposed and fought against use of it at my school. I’m not here to talk about those aspects because people much more knowledgeable than I have been saying that a lot – people like Jesse Stommel and Sean Michael Morris. And the sale announcement last week has brought a lot of faculty and teacher anger out in public about the sale. What I want to talk about is the numbers on this deal (I am an economist, after all). $1.75 billion for this company. That’s a pretty hefty valuation. Especially for a company that really isn’t that big and hasn’t been a huge growth tear. Yes, it’s been growing and the core product/service probably has a lot of room to expand internationally. But from what I can tell on the Interwebs, Turnitin probably has annual revenue in the $127.7 million range. That’s million with a m. 1.75 B to buy an annual 127.7 M. That means Advance is paying approximately 14 times annual revenue to buy it. Valuation of a company as a multiple of the annual revenue is common way in finance of comparing whether a deal is highly valued or cheaply valued, especially for technology companies and startups. Turnitin isn’t exactly a startup – it was founded circa 1998, but it’s still a “tech” company. For a tech company 14 x revenue isn’t out of range, but it’s not cheap either. Tech companies, especially ones that are expected to grow fast don’t usually have strong current earnings (profits), so revenues times a multiplier is used to estimate value. So what this valuation tells us is that Advance expects Turnitin to produce some very significant growth – probably much faster than Turnitin has achieved so far in it’s 20 year life. And that’s what scares me. Advance isn’t really just a “family-owned company” as some reports have it. Yes, the ownership of Advance is private and dominated by descendants of Newhouse family (think newspaper publishers). But “family-owned” sounds warm and fuzzy like the diner down the street where you get breakfast. Advance is a serious technology, publishing, and communications conglomerate. And they’ve got ambitions. And they’re serious with their money. They think like venture investors. If they invest $1.75 billion, they’ll expect to turn it into $100 billion or more. That’s the game. Even if they had modest ambitions and only wanted to turn Turnitin into (read those last three words again just for fun) a modest 10 or 20 billion dollar company, they have to do something big and different. Turnitin isn’t getting to that range on it’s own by doing what they currently do: call students cheats and check for plagiarism. Chris Caren, chief executive of Turnitin, said the company’s next step is to become a platform for colleges and high schools to submit all types of student assignments, digital or on paper. It would then use AI to help instructors review that work to, among other things, spot at-risk students and devise remediation plans. The company is also developing Turnitin’s software to branch out into the STEM fields and detect plagiarism in coding, for example. In other words, it hopes to become a one-stop shop for all sorts of tech-driven teaching services. It’s time we connect the dots, folks. Advance isn’t just a newspaper publisher. They’re adept at cookies, tracking of readers on the web, and data collection just as Facebook and Google are. They publish online magazines (Conde Nast, hello?). They publish Reddit and Arstechnica and other sites. They also have very capable big data analysis capabilities (1010data) that “transforms Big Data into smart insights to create the High-Definition Enterprise that can anticipate and respond to change” for 850 large companies. In the Chronicle article, Sean Michael Morris rightly observes that Advance/Turnitin could develop profiles of students using their data and monetize that via marketing and advertising. That’s true but I think we’re missing the mark. We’re being distracted by the fact the big two of early surveillance capitalism, Facebook and Google, have monetized their vast troves of surveillance data by using it to sell advertising. Rule of thumb in business strategy: there’s only room for 2-3 big monsters in any particular big industry. I don’t think Advance/Turnitin will go that way. I think it will be worse. They’re already pushing automated-grading systems and student “feedback” systems. There’s no technological difference between a system that checks a student’s written posting or submission for plagiarism against a database of collected writings and a system that checks those same posts/submissions against a database of “approved” thoughts and phrases. In a way, isn’t that what grading is anyway? Advance/Turnitin can easily morph into the thought police. But can thought policing be monetized? You bet. First, any nation that thinks a social credit system for controlling ordinary behaviors like jay-walking is a good idea, will love the idea of policing thoughts and utterances. That will be worth a pretty penny. Let’s suppose that social credit would never take off in the US or Western Europe (an assumption I am loath to make). Many, many institutions of higher education will jump at such a system. It’s just an extension of grading – until the database of vetoed utterances, ideas, or word strings is expanded to include controversial ideas. Are you going to tell me there aren’t some religious based schools that would buy a system that automatically rejects papers or forum postings that suggest abortion is acceptable? Of course, the system won’t just “reject”, it will provide “feedback”. Those controversial ideas can be handled automatically and merged with the “inclusive” repository of acceptable learning materials (free!) which is also, ironically, the exclusive source of learning materials. For profit colleges will love the systems since they’ ll allow further cutbacks on faculty. Replacing labor with capital investment is one the oldest tricks in the capitalist toolchest. And, those colleges will get automated stats and data “proving” their students learned! Not only were the students’ papers “correct” but everything they’ve said on Reddit and other social forums since has conformed to the acceptable. Forget social credit. We’ve got the possible (probable?) platform for thought control scoring. By all means let’s complain, scream, and object to the abuses of the Turnitin plagiarism model. But let’s keep our eyes open for the next big data thing. 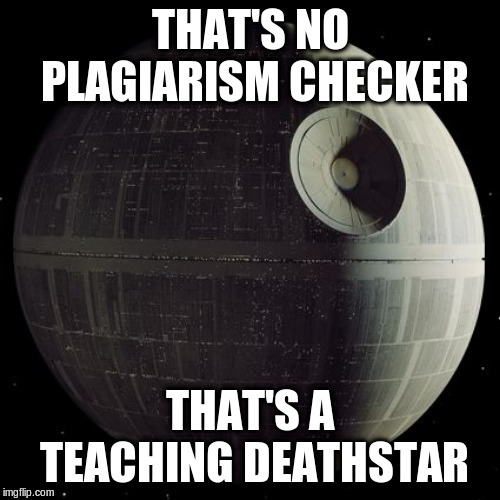 That’s no plagiarism checker. That’s the teaching death star. This my main blog. I mainly discuss economics issues and higher ed issues, with a special emphasis on open learning. The day job is teaching economics at Lansing Community College, where I spend my time trying to translate economic theory into plain language for students and make sense of economic events. However, the thoughts on this site are my own and do not represent the thinking or positions of Lansing Community College, its administration, students, or faculty. This is just my thoughts and insights. Everybody is welcome, not just students. This work by James Luke is licensed under a Creative Commons Attribution-ShareAlike 4.0 International License.